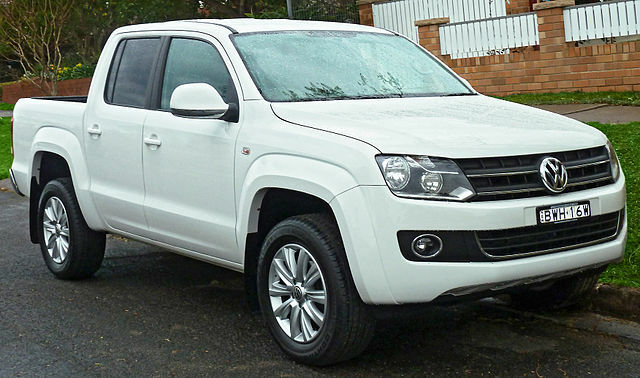 With the “chicken tax” removed, the Volkswagen Amarok could be readied for the US market. There may be no subject more contentious in the United States than taxation. Every citizen pays taxes and it is nearly impossible to avoid that expenditure. While there are some taxes that are easy to understand, such as a sales tax on purchases and property taxes on homes, there are other taxes that just don’t seem sensible or are downright maddening. One such tax that stirs the ire of automotive enthusiasts is the so-called “chicken tax” applied to light-duty pickup trucks. The appellation seems misplaced, but under closer scrutiny the tie-in to the original and retaliatory chicken tax should be understood. We’’ll take a look at this tax and its future, especially as a pair of new trade agreements may finally render the chicken tax null and void. In the early 1960s, the United States was battling with Europe’s Common Market regarding the export of US chickens to the continent. In response to US imports that they believed were hurting European farmers, the European Economic Community (EEC) raised tariffs on imported chicken, essentially closing the market to US producers. After more than a year of diplomatic negotiations, the United States responded by slapping a 25 percent chicken tax on four items of importance to European exporters: brandy, dextrin, potato starch and light trucks. In 1963, the Chicken War began and still rages today, although only light trucks are still taxed. The other three items have since been removed from the tax. Further, the Chicken Tax — now a tax on light trucks — applies to all manufacturers, not just those based in Europe. With the chicken tax in force, foreign automakers found themselves squeezed out of a lucrative market. But not for long. Indeed, manufacturers soon devised ways to bypass the tariff, by looking for loopholes. Those loopholes, when exploited, lowered the tariff to a more reasonable 4 percent. Japanese manufacturers were at the forefront of driving through the loopholes. They did so by exporting only part of the pickup truck composed of the cab and chassis, leaving off the truck bed or box. When the vehicles arrived in the US, they would then be upfitted with a cargo box and marketed stateside. The 1970s was the heyday for small pickup trucks, with manufacturers such as Toyota, Nissan, Mitsubishi, Subaru and Mazda participating in the US market. Moreover, the US manufacturers jumped in with their own models as Ford imported the Courier from Mazda and Chevrolet the Luv from Isuzu. By 1980, legislators closed the cab chassis loophole as both General Motors and Ford readied home-built models such as the Chevrolet S-10 and the Ford Ranger. Despite the tariff, Japanese manufacturers continued to import pickup trucks, but also began building factories in North America to produce them locally. Subaru found yet another loophole in the law that it exploited throughout the 1980s. Specifically, by placing a pair of rear facing seats in the cab, the company called its Brat pickup truck a passenger vehicle. That loophole was closed as the 1980s came to and end. Although the chicken tax was left in place to protect GM, Ford and Chrysler, the US manufacturers have always looked for ways to circumvent the tariff as well. Certainly, truck brands such as Ford, Chevrolet, GMC and Dodge Ram have benefited from the tariff, but all three manufacturers have looked for ways to burgeon their own fleets with carefully selected models. In the 2000s, DaimlerChrysler began to import the Dodge Sprinter van (later the Mercedes-Benz Sprinter). Cargo versions of the van were subject to the chicken tax, while passenger versions were not. Thus, partially assembled cargo Sprinters were sent stateside with upfitting completed in South Carolina. Ford has avoided the chicken tax with its Transit Connect van, built in Turkey. All models are imported as passenger vans, thus avoiding the tax. Once in the US, those models destined as cargo vans are modified accordingly. A push to end the chicken tax has been going on for decades. Much of that effort has fallen on deaf ears, with no concerted effort to eliminate the tax. Until now. Two new trade deals are now in place — the Trans-Pacific Partnership (TPP) and the Transatlantic Trade and Investment Partnership (T-TIP) — and each one will make the chicken tax history. In essence, the Obama administration (and subsequent administrations) now have the ability to negotiate trade agreements and submit these to Congress without worry that power sucking amendments would be added. A treaty with Pacific Rim countries will most likely go before Congress this fall, but the European version will take longer. The chicken tax and other tariffs will gradually disappear, but it may take years as they’re gradually rolled back. Are New Models on the Way? With the chicken tax removed, might we finally see many of the smaller pickup trucks that the world enjoys stateside? Certainly, manufacturers such as Mitsubishi, Volkswagen, and Mazda have vehicles that might be considered for the US market. However, with pickup truck buyers overwhelmingly interested in pickups with robust towing and off-roading characteristics, the demand may not be as strong as some have hoped. Then there is also the matter of making such trucks compliant to US crashworthiness and emissions standards. Ford hasn’t built the Ranger stateside in five years and now has a global, unibody version built in Thailand. Ford has not given any indication that it wants to sell a model to complement its full-size F-150, but that could change. Yet, the latest Ranger wouldn’t have the body-on-frame durability of the Chevrolet Colorado, Toyota Tacoma, GMC Canyon or the Nissan Frontier, giving it a distinct disadvantage.